For the record, pandas are not bears. In teddy bear taxonomy, however, they are, and in fact are often no different from other teddies except for their coloration. This panda pattern attempts to be a little more panda-ish, though it’s an old pattern and I think I could get quite a bit closer today. The panda shown here isn’t finished – he needs quite a bit of needlesculpting on his muzzle, though if you make him in a shorter-pile fabric he won’t need it. The arms are sewn with no paw pads, because (don’t laugh) I hadn’t yet physically seen a bear with arms in this pose, and didn’t realize they were supposed to have them. It’s much easier to sew this way, I have to say. If you want to insert them, you should probably extend the end of the paw a bit to accommodate them. The neck joint is like Teddy Wolf’s, in that instead of gathering the neck edge, you’ll sew in a circle of fabric (1-1/8″, for a 1″ disc) to the top of the body and the bottom of the neck. Aside from that, he’s a pretty conventional teddy bear. A general knowledge of teddy-bear making is assumed, but if you are just starting to make your own teddy bears, then you can find construction instructions in many teddy bear making books at the library. One such book to try is 101 Bears to Make by Nancy Tillberg. A panda is in fact a bear. I think you may have mixed that up with koalas. 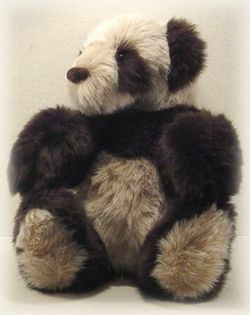 Hi, Ann, This panda pattern originally appeared on the SavvySeams web site, which is now offline. I had permission to reproduce the pattern, and I wanted to publish it to keep it available on the net. I’d like to help you out, but unfortunately there are not likely to be any updates or additions. Anyway you could leave a little more instruction?